MANCHESTER City manager Pep Guardiola was pleased with his team's second-half showing but said he was unhappy with a sluggish start in the 5-0 English Premier League success over Crystal Palace. The win moved City to the top of the EPL on goal difference from Manchester United, which won 1-0 at Southampton. Palace hit the post twice in the first half and is still seeking a first point and first goal in the league campaign and Guardiola admitted his side was second best in the opening 45 minutes. "We started well, in the first five or 10 minutes, but after that we were not good,” Guardiola said. "We did not move the ball well but in the second half we were at our level; we regained our tempo. 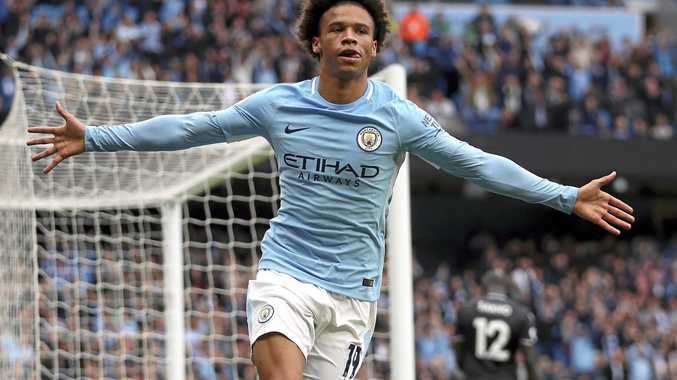 Leroy Sane's goal just before half-time gave the home team the momentum and went on to smash in four more against a Palace side which became the first side in English Football League history to lose their opening six games of the season without scoring. Raheem Sterling helped himself to a quick-fire brace after the break, before Sergio Aguero got a goal 11 minutes from time. Fabian Delph's late stunner ensured City became the first side to score five or more goals in three consecutive top-flight games in the same season since Blackburn in 1958-59. United struggled at Southampton but Romelu Lukaku's first-half goal was enough to ensure it stays second. Referee Craig Pawson's decision to send manager Jose Mourinho to the stands late on put a dampener on the result at St Mary's. Alvaro Morata's hat-trick helped Chelsea to keep pace with the leaders. Antonio Conte's men remain three points behind in third after their 4-0 win at Stoke. Liverpool won 3-2 at Leicester City but had Simon Mignolet to thank for saving a penalty from Jamie Vardy which would have levelled the scores at 3-3. Tottenham climbed into the top four after a thrilling 3-2 win at London Stadium over West Ham. Two goals from Harry Kane and one from Christian Eriksen helped Spurs to ease into a 3-0 lead but goals from Javier Hernandez and Cheikhou Kouyate ensured a nervy finish for the visitors, who had Serge Aurier sent off with 20 minutes to go. At Goodison Park Oumar Niasse scored a double as Everton came from behind to defeat Bournemouth 2-1. In south Wales, Richarlison scored a last-gasp winner to earn Watford a 2-1 victory over Swansea - the Hornets' third away success in a row. Burnley drew with Huddersfield 0-0.